Start growing fresh herbs in your own kitchen in less than a week, even if you know nothing about gardening! 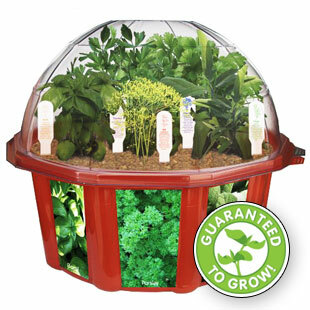 This complete kit contains everything you need to keep fresh herbs in your home for months with very little maintenance. There is nothing better to spice up your cooking than having fresh herbs readily available when you need them! Because of the closed terrarium, the herbs rarely even need to be watered. It's easy! It's fun! It's decorative! You can transplant seedlings from the terrarium to an outdoor garden, or you can grow and use them right out of the culinary dome and clip off what your recipes call for. (Don't worry, they grow back.) This is a fun and exciting experience for you and your family.